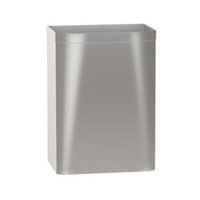 [XPB-3A15-11] Our Stainless Steel Waste Receptacle is fabricated in gauge stainless steel with exposed surfaces in architectural satin finish. This Waste Receptacle is surface mounted and has a 16.5 gallon capacity. For shipping quotes, discount orders or questions please call our Customer Service Center at 1-877-483-9270.